The internet is a connection to a whole world of information, but what if you could connect with the information of your non-physical side of your life? The Cosmic Internet: Explanations from the Other Side is a metaphysical guide to the non-physical world and how to explore it and understand it, and understand the spiritual and metaphysical nature of our lives. For spirituality readers who want another take on the nature of the universe, The Cosmic Internet is very much recommended reading. How can dead people talk with us, and talk to each other - regardless when they lived - and talk about our time, which was their future? How can they be aware of us, and of each other, and of everything we know? Why should they be interested in talking to us? The Cosmic Internet has five sections. A Model of Our Minds on the Other Side provides a way to see the interaction of lives in the three-dimensional physical world and the greater life that exists on the non-physical side of things. The Individual as Convenient Fiction, chapter two, reinterprets our lives and essence, showing that what we think we know about ourselves is true only partially, and only from a particular point of view. The Physical and the Non-Physical sets out, as plainly as possible, the differences and interactions between the two sides of the metaphorical veil. This chapter, more than any other, attempts to show how and why our lives in the physical world are equally important to those on the other side. Living Connected and Shaping Your Life, chapters four and five, move from description of what is to suggestions about what you can do to live a life that is richer, more satisfying, more meaningful. The book's first chapter, "A Model of Our Minds on the Other Side," provides a way to see the interaction of lives in the three-dimensional physical world and the greater life that exists on the non-physical side of things. "The Individual as Convenient Fiction," chapter two, reinterprets our lives and essence, showing that what we think we know about ourselves is true only partially, and only from a particular point of view. Chapter three, "The Physical and the Non-Physical," sets out, as plainly as possible, the differences and interactions between the two sides of the metaphorical veil. This chapter, more than any other, attempts to show how and why our lives in the physical world are equally important to those on the other side. Chapters Four and Five, "Living Connected" and "Shaping Your Life," move from description of what is to suggestions about what you can do to live a life that is richer, more satisfying, more meaningful. To obtain The Cosmic Internet from Amazon.com, click here! When I was young, I'd think of how we spend our lives learning things, accumulating skills and experiences, constructing inner worlds, and I'd think, "all gone, the moment we die." I was all but paralyzed by the pointlessness of it all. Some people don't seem to notice. Others, having abandoned hope of physical immortality, work to "leave the world a better place," or seek to leave an immortal name. Still others hope for eternal life in paradise. But none of these ways of experiencing life seemed to me to connect with how we actually live. The afterlife in scriptures remained a vague idea, and life without an afterlife made even less sense. But if neither the believers nor the materialists provide us with a credible picture of the meaning and nature of life, where could we find one? Ideally, we would go right to the source, communicating directly with the other side of life, the non-physical side. Interestingly, some people insisted that this is possible. So the question became, is it possible? And if possible, is it safe? These questions aren't new. They have been asked and answered for as long as people have been aware that material life is only half the picture. The answers have come in different forms, shaped to the needs of different peoples, different civilizations. But old words go dead on new generations, and so old truths have to be rediscovered and restated to be heard. In communicating with certain minds in the non-physical world, I have gotten information that amounts to an intellectually respectable model of our lives in the physical and non-physical world. This book is my attempt to convey it. "Clear and fascinating, and extremely important. Connecting to the cosmic Internet is connecting to a deeper or higher reality, and through that reality to the cosmos. This book is a manual for doing just that." "Frank DeMarco's book, The Cosmic Internet, masterfully written from firsthand experience, asks the hard questions about life both here and in the hereafter. It provides thought-provoking insight into questions that have long needed addressing. I do not say this lightly, as this book made me pause and reflect deeply upon many things, answering questions I had not even thought about asking. 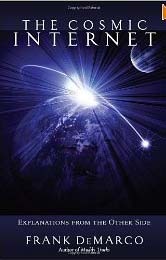 The Cosmic Internet is quite possibly the most interesting book I have ever read." "Frank DeMarco is an adventurer of the intellect and of the spirit. He challenges our definitions of reality with compassionate, down-to-earth writing. If this is mysticism, it's a singularly practical mysticism." "In the area of metaphysics there is a ton of material to read that might well have inspirational and informational content for the seeker. But which voices to heed? These days, that's the quandary. Frank DeMarco's book, The Cosmic Internet, offers an exceptionally lucid and informative voice. Who are we? Why are we here? What is the nature of healing? What about guidance? All these questions are treated and so many more! This is a contact the seeker will find full of resources. Buy this book!" "The Cosmic Internet is filled with provocative insights, great intelligence, warm humor, and above all, the passionate quest for truth. Much more than a fascinating record of conversations with `non-physical friends' from `the other side,' it stands as an eloquent testimony to the author's courage in publicly grappling with the central questions of human existence: Who and what am I? What is my life purpose? What is `reality'? How can I trust my own inner experience in a culture that denies the value of inwardness? Frank DeMarco must be defined as one of the premier visionary healers of our age. For above all, it is wholeness--health, in the true sense of the term--that is his quest and question." "Fifty years from now a new generation will wonder why this was such a ground-breaking book. They will be astounded that all this information had to be introduced and explained in The Cosmic Internet. As Frank tells us, but actually reminds us, we are the "ringmaster" one time and this book helps us make the most of our experience. HOW TO CONNECT TO THE GUIDANCE WE ALL HAVE ACCESS TO . . . If you could communicate directly with the non-physical side of life, what would you ask? Wouldn't you want to know the meaning of our physical lives? Wouldn't you want to know if in fact after our physical lives are concluded, we continue to exist in some way? The Cosmic Internet is the record of just such conversations with non-physical beings. These conversations, as the author makes clear, are not the result of a special gift, but are the sort of communication available to anyone willing to make the effort. In the tradition of Jane Roberts (Seth) and others, this book poses significant questions about the nature of our lives, and produces valuable new insights into the purpose of life and how the universe works. "The Cosmic Internet is a book filled with provocative insights, great intelligence, warm humor, and above all, the passionate quest for truth . . . it stands as an eloquent testimony to the author's courage in publicly grappling with the central questions of human existence: Who and what am I? What is my life purpose? What is `reality'?" "The Cosmic Internet is quite possibly the most interesting book I have ever read."